Questions on how to setup? E-4203 printer, the first of a comprehensive line of entry-level printers designed for low- to medium-volume labeling applications. The E-4203 is a small, compact, thermal printer designed for a variety of label and tag printing applications. In either direct thermal or thermal transfer mode, the E-4203 is designed to meet the needs of sub-industrial printing applications. The E-4203 represents a significant achievement in printer design and engineering. Its small footprint, sleek enclosure and enhanced electronics and firmware combined result in an outstanding entry-level printer. 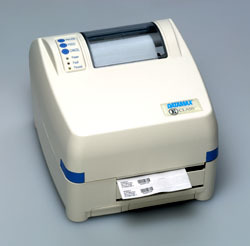 The Datamax E-4203 can print a wide variety of labels ranging from small office shipping labels to compliance and general purpose product identification labels and jewelry tags. Medical and commercial laboratories, automobile service shops, walk-in shipping and mail centers, and inventory stock rooms are all typical examples of the types of users that can benefit from the E-4203. And with PDF417, Datamatrix, and MaxiCode two dimensional bar code capabilities, the E-4203 can print complex healthcare or transportation symbols and label formats. The E-4203 has emerged as the printer of choice in applications requiring less than 1,000 labels per day.  Modular design facilities adding and/or changing options with ease.  Easy to upgrade and reconfigure for business growth.  Easy to maintain-easy printhead access for regular cleaning.  Standard parallel and serial interfaces allow easy integration into your system.  Optional Ethernet support allows the printer to connect to virtually any host system environment.